Schengen visa application rejected because my US visa stamp expires in December. What are my options? Is it true that my visa stamp needs to be valid for 3 months after my trip, even though I can legally stay in the US until 2017? Does anyone have any suggestions for getting a Schengen visa in my situation? All the Schengen rules from here to Land's End will not help you if the consulate is rejecting your application, but briefly a Schengen member can reject your application if your travel document will have less than 90 days validity on your planned departure from Schengen. For your purposes, "travel document" means passport. It has nothing to do with the visas in your passport or your current immigration status in the USA. Some members will add a rule for individuals who are not applying in their home country and the rule will stipulate that a given immigration status is required. This varies according to the individual's nationality vis-a-vis the member state. 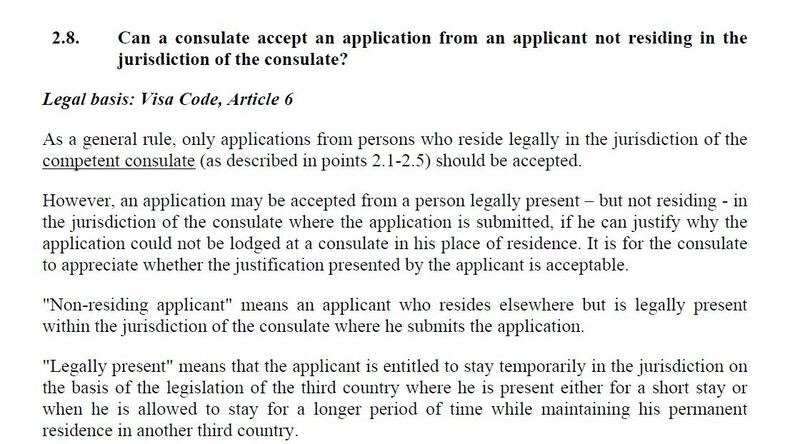 As written, the onus will be upon you to explain why it is excessive for you to carry out options 1 and 2: "It is for the consulate to appreciate whether the justification presented by the applicant is acceptable". Success will strongly depend upon your personal impact and articulation skills. If none of these options work out for your visit contemplated in October, then you will need to reschedule it to a more appropriate time. I spoke to multiple immigration lawyers and consultants and the consensus was that the consulate employee was poorly trained in US visa policy, as it was my US visa status that mattered, not the visa stamp. So I went back to the embassy to try again at a later date. This time, there was a different employee, and now, two weeks later, I have in my hands a Schengen visa. I was in a similar situation too and was Googling desperately to figure out if I would get a visa. I found this thread then, so I am mentioning my experience as a reply to this post - I hope this is useful to someone! The US visa on my passport expired in Apr2016, but I have an I797 valid until May2019. I wanted to spend a week vacationing in France on the way to my home country. I was a little apprehensive on how the rule would be interpreted, but my interview at the French Consulate in San Francisco last week was very smooth :) I showed them the I797s and the officer did not even ask about the expired visa stamp - and in fact there were no other queries or requests for additional documents beyond their checklist . I got the passport back in 3 days. The visa granted was multiple-entry with dates valid for 2 days before/after my journey begin/end dates. I had expected a 90 day visa but it doesn't really matter as I am planning to stick to those dates anyway. I wanted to keep it short, as it is a really basic question with an easy answer, but after reading comments I'll expand it a bit. To enter the Schengen area you need a travel document for you next destination, valid for at least 90 days after the day you plan to leave; this is by law, so you have no options around this. Your only option is to get a US Visa extension. I tried to quote those here, but honestly it take too much. For all who needs to better understand things just read them, is just a couple of hours and fully understandable. To be allowed to enter Schengen area you must demonstrate to have the right to stay here indefinitely or to be able to exit from it. Notice: exiting, not just going back to starting the point. You just need to demonstrate that you can reach your next destination, whatever it may be. The above are NOT LINKED, you can have one without the other, they serve different purposes. For leaving USA you need a valid passport and to reenter you need it, too. Passport scope is simply to certify your identity internationally, it has no other function per se. To enter USA you need a valid document attesting you can actually do it. Your Visa is enough, and it is still valid, so this is ok.
Again, your passport per se is not a valid document to reenter the USA, as you are an alien. But your passport with an US Visa on, it is. So, for your passport to be a document whose validity extend at least three months after the intended date of departure from the territory of the Member States it must have a Visa on it valid three months after the intended date of departure etc. etc. etc. So, again, to solve your problem you need an extension to your US Visa. How to do that or if it is possible...well, I honestly don't know. Not the answer you're looking for? Browse other questions tagged visas schengen customs-and-immigration h1b-visas visa-rejections or ask your own question. Can you apply for a Schengen visa from the US if your H1-B is expired? Can I get a Schengen visa if my UK visa expires in 2 months? Need I leave and reenter the Schengen area after my work visa expires to become a tourist? Can I apply for a Schengen visa if my US residency expires in less than 90 days after my return? Non-EU citizen in Spain with a valid Italian Tourism Schengen Visa and applying for PhD in Spain, What do I do?